Disclaimer: This is not a sponsored post. We were provided with a copy of Elena Of Avalor: Celebrations To Remember in order to facilitate this post. We are just around the corner from it being Fall and that means that the holiday's are fast approaching. Are you ready to celebrate and make family memories? We are, and we got to start our countdown by doing our very own Fiesta/Carnival Mask. In celebration of the new Elena Of Avalor: Celebrations to Remember DVD that came out. Keep reading to see all the fun we had and how you can win your own copy of the new Elena Of Avalor dvd. In order to make our fun fiesta mask we stopped by our favorite craft store and bought some colored cardboards. We could have used some construction paper, but we wanted to make sure that our mask was firm enough to hold up for a while. There were some little bags full of knick knacks which included those fun colored plastic gems, those were definitely perfect for adding that special sparkle to out first mask. Before we cut out our fiesta mask from the colored cardboard, Valentina and her grandma made a stencil with a paper napkin. That way it could be easier to cut it out from the colored cardboard. Then the fun began, it was time to decorate the fiesta mask. Everyone knows, that a first includes color and sparkle. Valentina and her Grandma made sure to include a lot of each, while talking and laughing at the same time. It definitely made for a great night of family memories. First time that I can't see our masterpiece, all the credit goes to Valentina and her abuelita. They both worked together to make the most perfect fiesta mask. 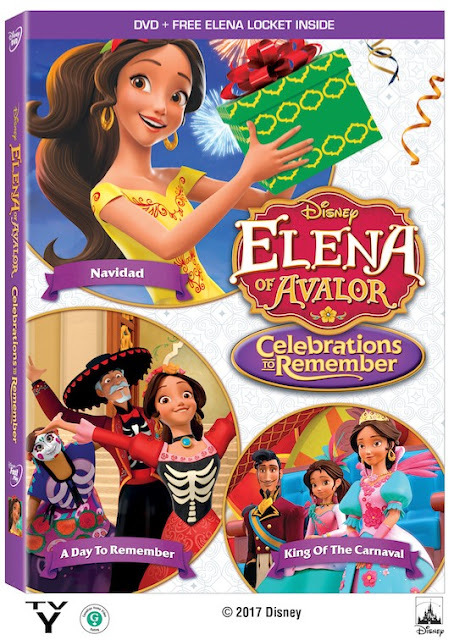 Which goes perfect with the new Elena of Avalor: Celebrations To Remember dvd, whose primary message is family and making memories during the holidays coming up. Light the candles, prepare the feasts and share the fun of Celebrations to Remember. Join Crown Princess Elena, along with her family and friends, as they honor the past, rejoice in the present and greet the future with music, laughter and love. Whether celebrating Navidad, Dia de los Muertos or Carnaval, new and older traditions alike play a part. And even though everyone doesn’t always agree on the best way to get the party started, one thing is perfectly clear: holidays aren’t about what you do; they’re about the special people you spend them with. Each Dvd comes with a Free Elena Locket! So as you get ready for the holidays coming up make sure to grab a copy of Elena Of Avalor: Celebrations To Remember and start making family memories to be passed down for generations. Now for some fun news. I have 3 copies of Elena of Avalor: Celebrations To Remember DVD to giveaway. That means that 3 lucky C'est La Vie Readers will win a copy. 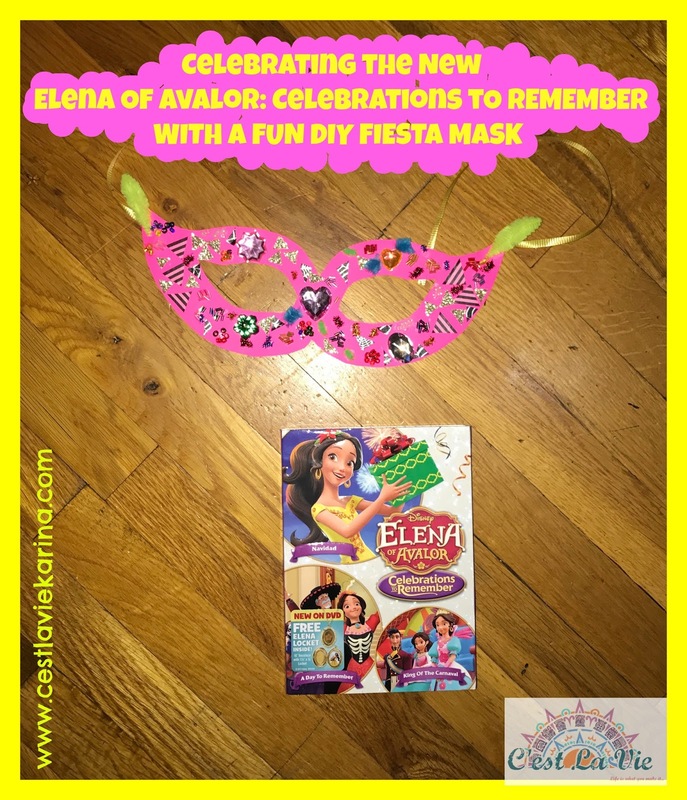 1 comment on "Celebrating The New Elena Of Avalor: Celebrations To Remember With A Fun DIY Carnival Mask & A Giveaway "
Although I haven't seen this cartoon of Allen I am but I really like the character and The Mask that has been drafted has been drafted very beautifully and creatively.